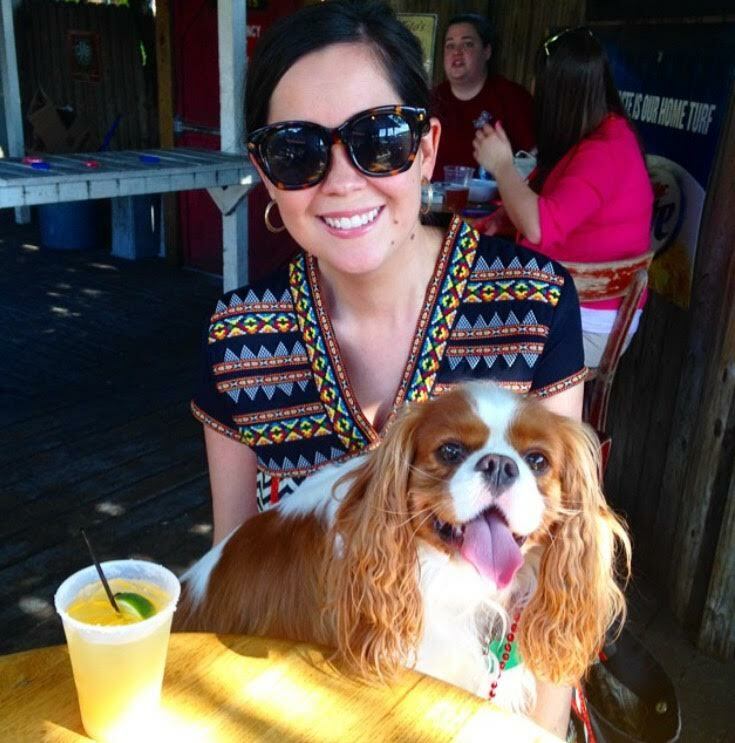 Today's bar cart is from the darling Megan Harrington and her precious pup Finley. I first met Megan on Instagram and could not stop stalking commenting on her precious photos. Megan has incredible style and has recently been working on her home. I am madly in love with the work she has completed. The wallpaper in her entry way has me swooning for days! She is also a new mommy to the most adorable baby. You will fall in love with Libby Sloane the moment you see her! Isn't he the most precious little side kick you have ever laid your eyes on? I do adore that sweet Finley Foo! I was excited to add Megan to our growing list of tastemakers, her style is perfect for this series. You will adore her as much as I do. First of all, tell me about you. Who is Megan? 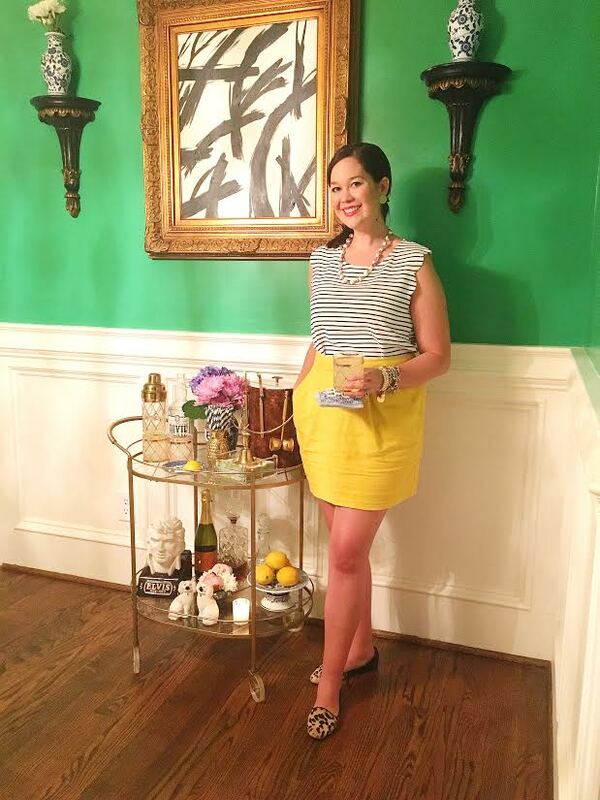 I'm a southern wife, mama, and decorator who loves anything preppy, chinoiserie, and palm beachy! 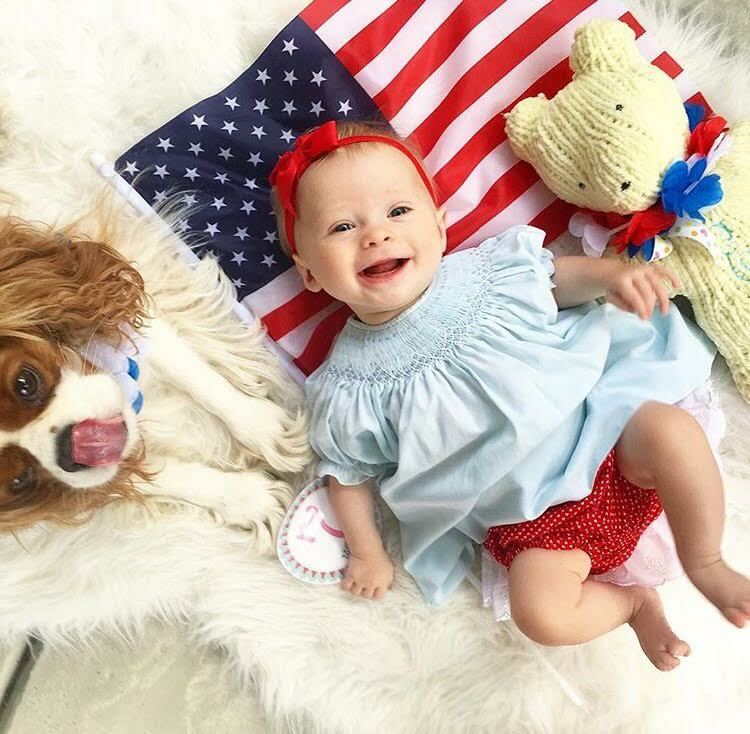 My husband and I recently welcomed our first little one, Libby Sloane...so she, along with our cavalier, Finley, have been keeping me on my toes for the last six months! We are both from North Carolina (any Meredith Angels out there? ), we moved to Amarillo, TX shortly after getting married, and for the last two years we've been in Columbia, SC! We've really enjoyed traveling anywhere in between, but we are so happy to have settled back in the Carolinas, closer to the mountains, our hometowns, and Charleston! I'm excited to launch my blog, Home of Harrington, in the next few weeks which will cover interior projects, styling, entertaining, mama hood, and all things that delight me! I love starting the day with a yummy breakfast and a stroll with my little squad! Then perhaps some yard sale-ing or wandering the aisles of an antique mall, lunch by the lake, and then a dip in the pool -- it is definitely #famouslyhot in Cola! Evenings are best spent cooking Mexican food or grilling with my husband and maybe a couple of friends! Now that Libby Sloane is 6 months, she can tag along pretty well! Hit up the antique malls for more blue & white!! Coffee! I'm obsessed with our Nespresso machine, and I don't skimp on some good creamer! I really enjoy a good Pinot Noir for winter, but Rosè or Vinho Verde have been my go to lately! Cilantro jalepeno margarita at this empanada spot in Raleigh! In general, though, I love a good fresh margarita-my hubby has mastered making them at home! I'm sharing with y'all a little twist, though- a Chilton--it was all the rage in Texas, but I used a little Dixie vodka (local to Charleston, and because it just goes with Elvis) instead of Tito's. 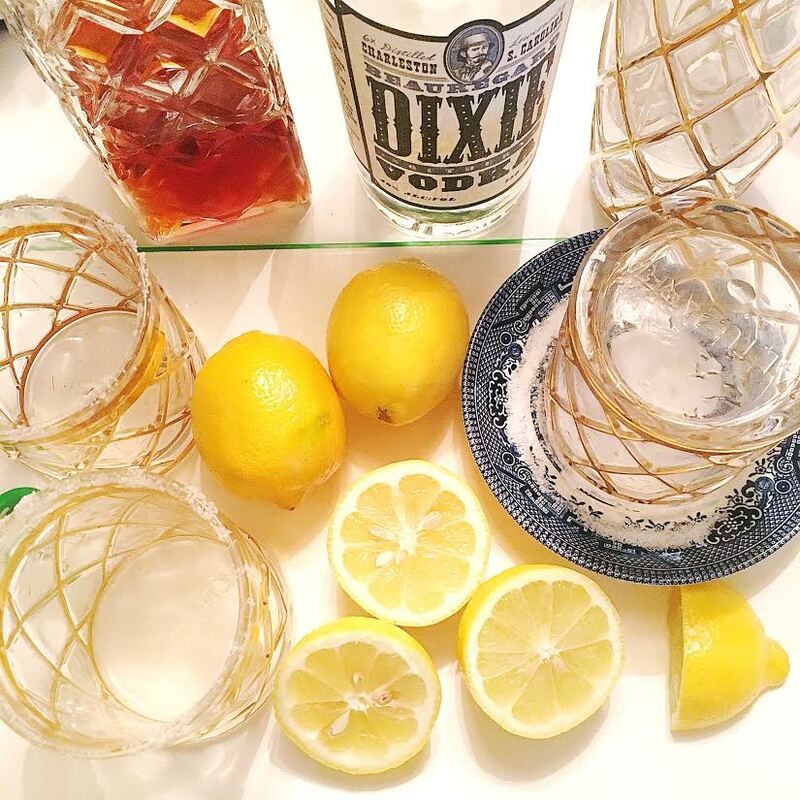 Fill a salt rimmed glass with ice, add 1.5 oz of vodka, squeeze in a lemon, top with soda water and ENJOY. Cheers, y'all! Instagram is my biggest source of inspiration these days because it's quick, but there are several blogs I love to read. I enjoy the one room challenge posts and I gain a ton of inspiration from traveling, antiquing, and shopping around. I'm still a little addicted to Pinterest! I love magazines and I really enjoy Domino and HGTV mag because they seem to show attainable design. This makes me chuckle a little because, oh, how things have changed! But, if we're being honest, you'd likely find me in gym clothes at Lowes or at home doing laundry, or possibly a swim suit by the pool with the baby!! 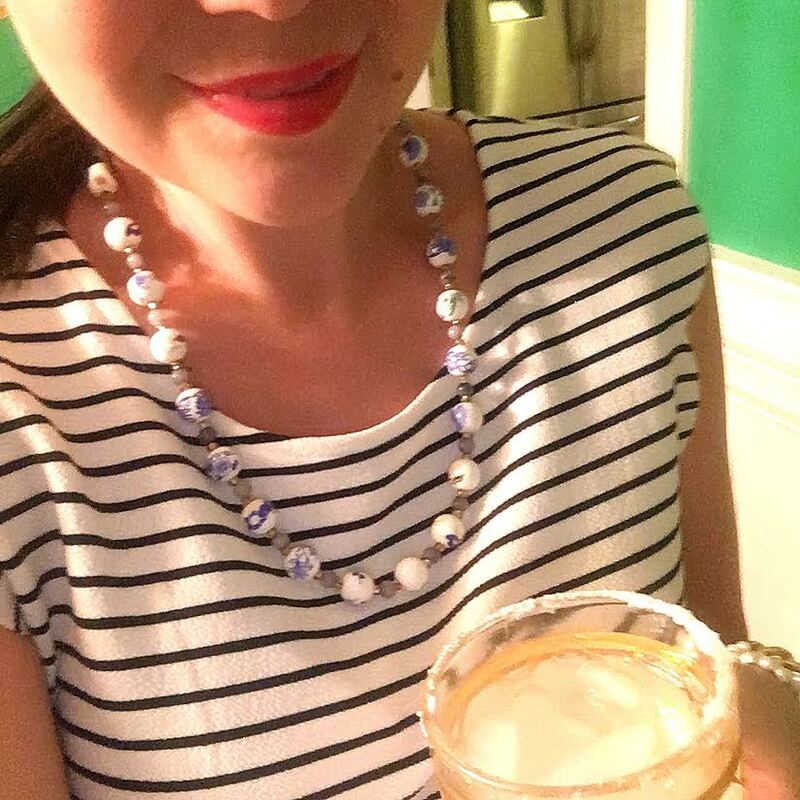 Now, if I'm out and about, braving the heat, you may find me in a breezy dress, Jack Rogers, and baby friendly accessories (chew beads, anyone?!) because I LOVE to accessorize and I miss getting to wear fun earrings! Cooking together with my husband, a glass of rosè, and watching silly reality tv- Southern Charm is a hoot and we've always been into The Bachelor! If things are super crazy, I love a good pedicure. Aside from my family (and photos!)... iPhone, Nest candles, fresh flowers, the bust of Elvis decanter, and my grandmothers cloisonné/antiques! Fun fact: my husband insisted on our wedding dance song to be "Can't Help Falling in Love," because it was the first song we ever danced to at another wedding..and then he surprised me with dance lessons! So... I pulled a fast one on him and had an Elvis impersonator sing it live at our reception, along with Elvis rendition of "Dixie." He was shocked! 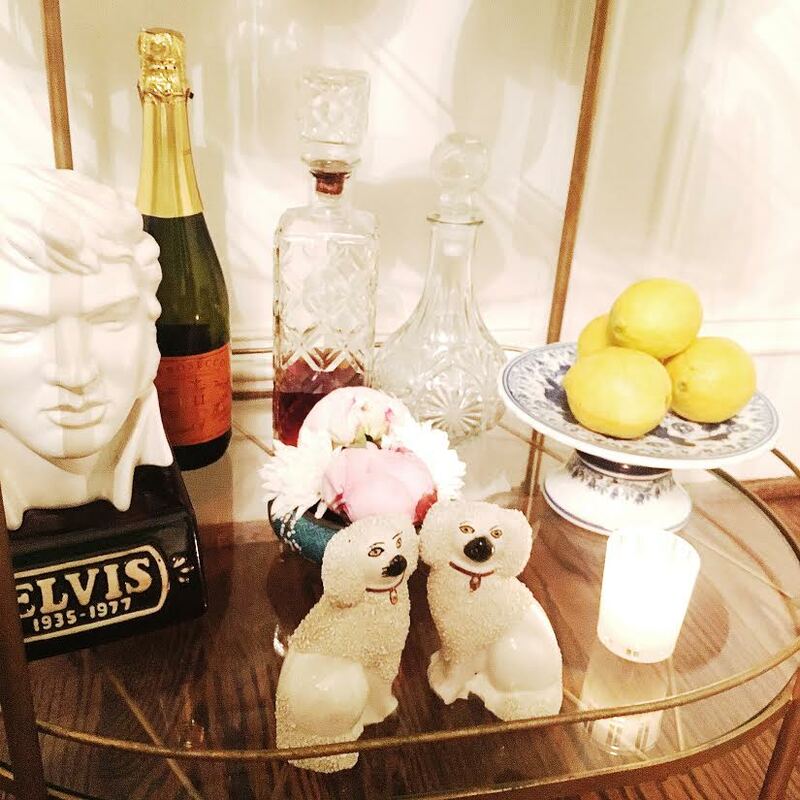 We've always had this running Elvis joke between us and we stumbled across the decanter while antiquing in Healdsburg with my aunts a few years ago. It will always remind me of that trip and all the fun we had. Plus, Elvis is always ready to greet friends with a bevy! How fun is that? "Always remember there was nothing worth sharing like the love that let us share our name"- comes from a little Avett Brothers tune and it's really the motto in our home, which we love opening up to host and welcome others! Isn't she just darling? I can't wait to follow along with her blog when she launches it, she has an amazing eye! 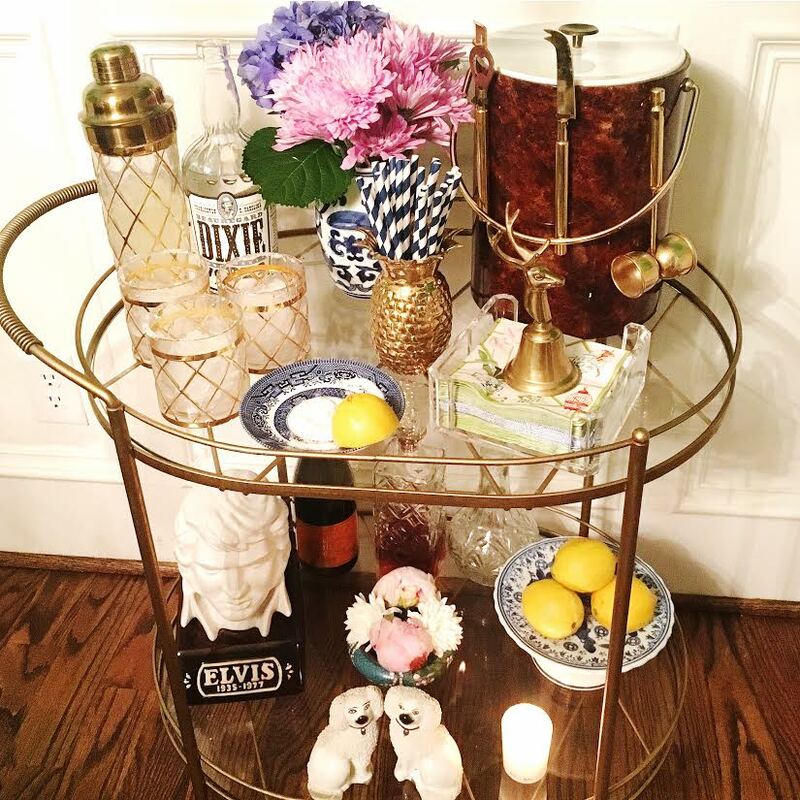 Thank you so much for sharing your bar cart and your favorite cocktail with us. I can't wait to try one for myself. 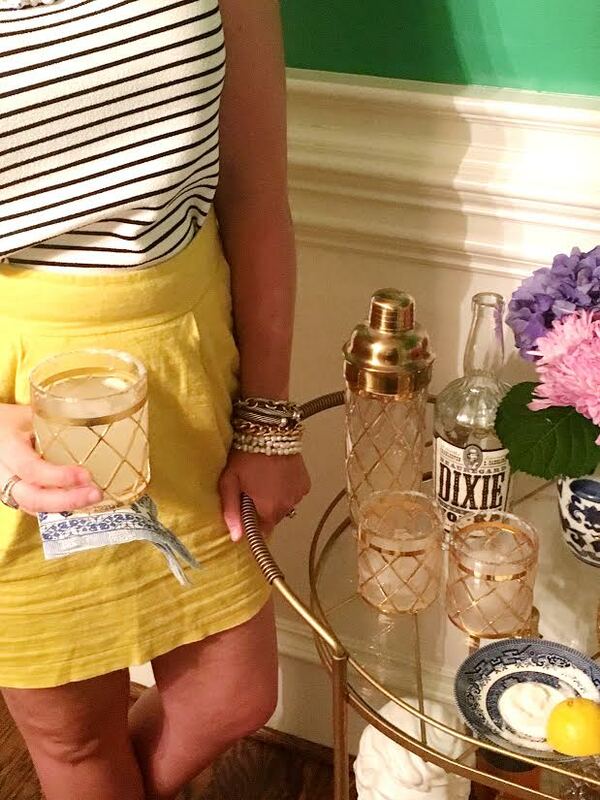 I love a good local liquor and must get my hands on some of that Dixie! I need to add some of my Staffordshire pups to my bar cart ... I can't believe I didn't think of it before! 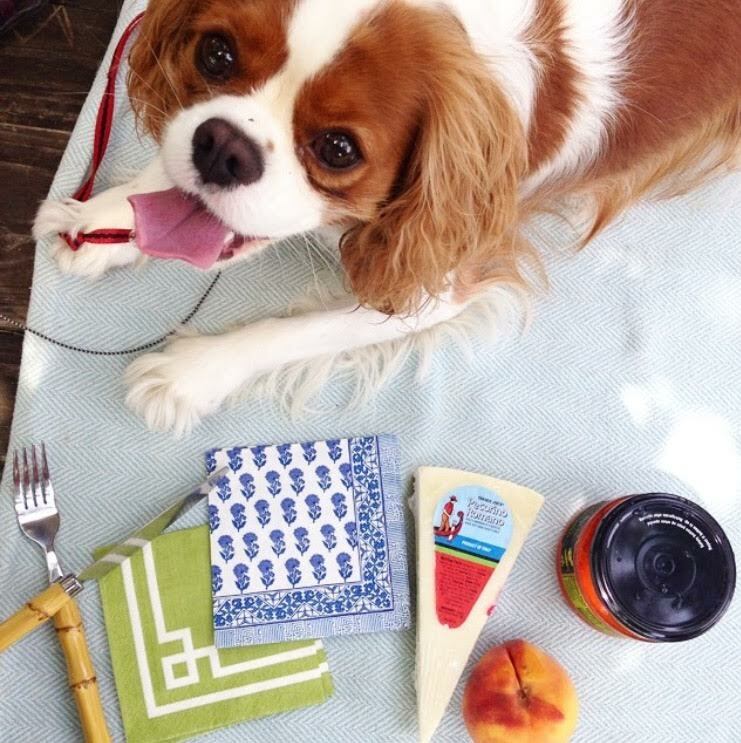 Today is the last day to enter The Loveliest monogram cocktail napkins giveaway. The winner will be announced at 5 pm, just in time for a celebration! Megan's home is really unique and beautifully crafted together with those adorable babies! Will definitely follow your blog and her blog as well because of the smart ideas that I share to my art students at papers board.